Instagram is very much similar to Facebook, Twitter and other social networking sites. 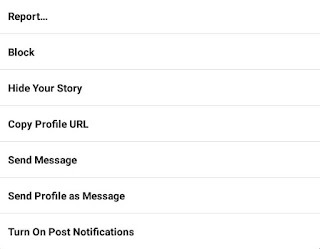 You can follow people to get their updates in your news feed and share your own photos and videos with other people from all around the world. When you visit someone's profile, you will see their profile picture in small circle at the top-left corner of the screen. The bad thing about Instagram is that, it doesn't lets you view the full size profile picture of the person. Unlike other photos, it's unclickable and can't be zoomed also. As far as quality doesn't matter, you can easily take profile's screenshot and then zoom it to view the picture more clearly. But if you want to download full size photo, then here I have a simple trick for you. First open Instagram app and find the person whose profile picture you want to see. Now tap the menu button (three dots at the top-right corner of the screen) and click "Copy Profile URL" option. The user's profile link will be copied to the clipboard. Note: Here adding "view-source:" is necessary because it is used to view the source code of webpage. Once you have edited the url, tap Go button to continue. After this, you have to find the image url. To search it quickly, click the Chrome's menu button (three dots) and then hit "Find in page" option. 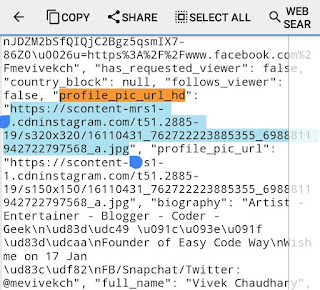 Now search "profile_pic_url_hd" term and copy the url next to it as marked in the below picture. Note: There are two occurrence of "profile_pic_url_hd" term. You have to consider first one. Alternatively, you can also search "og:image" term and copy its content url. 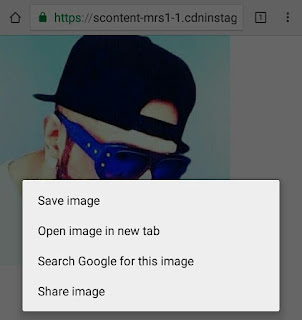 Now open the image url in new tab and there you will see profile picture. If it's not in full size, then remove /s150x150 part from the url and load webpage again. To download the photo, just tap it for seconds and click "Save Image" option. That's it. 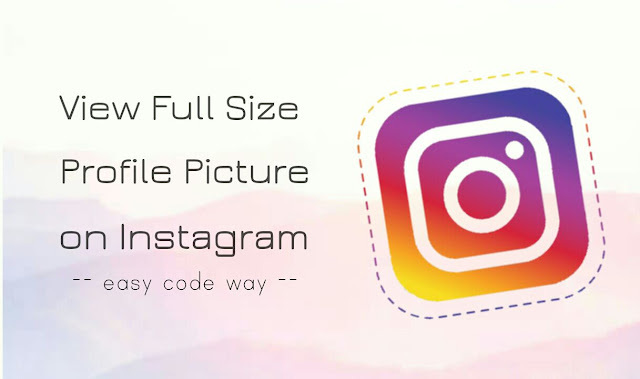 So this is how you can easily download full size profile picture on Instagram without using any third-party app. 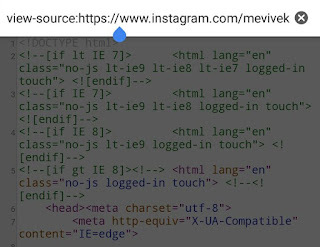 Also read this useful guide on how to download Instagram videos in your Android phone. If you facing any problem, feel free to share it in the comment box.